Eldon couplings are fitted with Viton Shore 75 seals as standard giving the coupling a temperature range of -20°C to +200°C. Customers requiring other high grade Elastomeric or PTFE seals fitted should contact their suppliers. Couplings are produced with BSPP threads as standard. NPT threads can be supplied on request. All dimensions are only intended to used as a guide. Exact dimensions are available from our sales team. 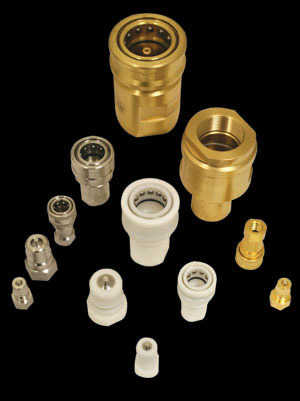 Contact our sales team if pressure ratings are above the figure stated. Working pressure is based on M.I.L-c-25427 which allows pressure peaks 50976 above working pressure. Pressure drop can be calculated using the following formula: Pressure Drop = (Litres/M in) ² (CV x 3.8) On connection/disconnection a small air inclusion/spillage occurs. Shown are the figures for the ¼ » - 1 » NB Coupling. Further information for larger couplings can be obtained from our sales team. Eldon Couplings are interchangeable with Hanson HK Series, Snaptite 72, Parker 60, Rectus 70KB and Aeroquip AD45 couplings.